I arrived at the site at approximately 8.20 and drove out to look at the twin conical mound owned by the Archaeological Conservancy, Md. B. After quickly assessing the mound and the impenetrable vegetation growth covering it, I went over to mound A to meet Jay and see what they were up to on their side. Once I arrived, Jay told me the trailer hauling the backhoe had a breakdown – they’d lost a tire. 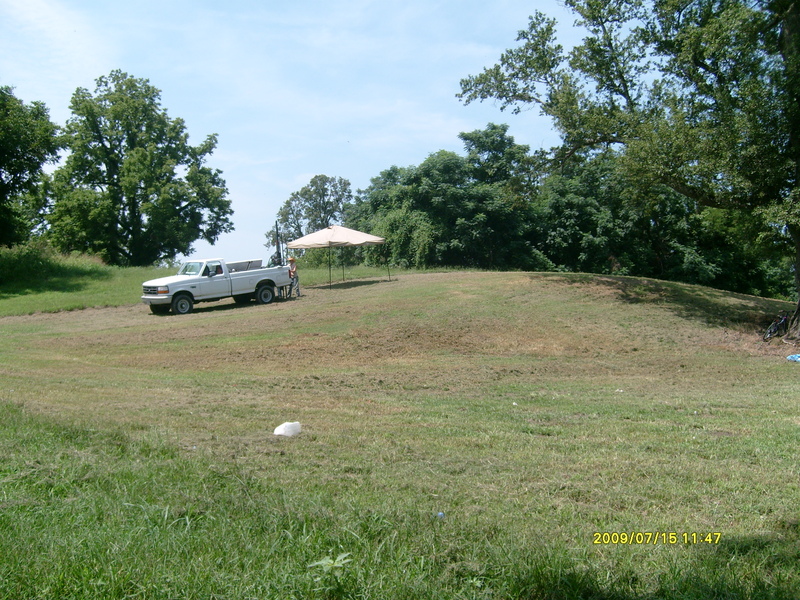 Since they wouldn’t arrive until much later that day, I decided to explore mound D, where I’d planned on coring that day. Jay mentioned to me that Brent Lansdell, an Ole Miss student, had excavated a trench on mound D a little while ago and that he’d show it to me. After reviewing what was happening in the field near Dr. Barr’s property, Jay and I drove over to Mound D – we eventually had to gather Eddie Henry and John Cappleman to try and find the trench. We walked all over the mound, which is huge, but had a hard time locating the trench. John eventually located it, but recalled they had backfilled it. Searching then for something to fill my time before the NRCS coring team arrived, I decided to try and map Mound B and Mound C using the GeoXT Trimble GPS device. Walking over Mound B was arduous and difficult since it was still in trees and many had fallen inside the mound. I used the device to map a general area of the site, walking around the mound, automatically taking points every so often. I’m unsure of how this map will appear since I’ve not uploaded the data yet. *Update – The data is up on my computer, but I have not georectified the data . Also, after talking with Kelsey Lowe and Jessica Crawford, who helped Aaron Fogel excavate on the mound, I learned that Mound B is covered in snakes. Yay. * I repeated the same procedure for mound C. Once I’d finished this, I observed Eddie and John using the down hole magnetic susceptibility meter on Mound C – when Kelsey arrives on Friday, we will be doing the same thing on mound D.
Rachel arrived with the Giddings rig and her new employee, Willie Terrie at about 11.30. We made brief small talk at Mound C and then I corralled them both to Mound D.
We placed core 6 midway up the flank on mound B – in retrospect this was a bad idea since we were trying to capture the mound stratigraphy, which would be most pronounced along the flank. We were able to extract approximately 1.5 core lengths, or close to 2 meters before the truck started sliding down the embankment – this was not good at all since, since this increased the chances of damaging the rig and the core bit/rods. We decided to more further down the mound and to use my truck as a brace to keep their truck from sliding (Cliff Jenkins has pictures of this). C6 appears similar to C7(below). This core was placed farther down the flank of Mound D. In this core, the top layer of soil below the humus appears to be highly weather, as it is light tan in color. Its possible this is slope wash or a weathered exterior surface. Below this is a rich organic layer, showing the third mound occupation surface. About 50 cmbs, we recovered another rich organic layer, which was immediately followed by basket loading. Around 227 cmbs we pick up a thin organic layer, followed by mound fill, and then another rich buried A around 250. Underneath this layer are natural soils. Rachel believes this mound was built on top of an older (allowed to weather) natural levee, thus indicating this mound was not built on an active water channel but possibly near an oxbow or old ridge/swale topography. This core was excavated on the top of Mound D – the top soils appear similar to C7 and then look to be consistent sandy fill – suggesting perhaps this mound was built in one continuous mound building episode, or perhaps at least the top most portion of the mound was built rather quickly. We characterized these soils rather quickly and didn’t excavate down to the natural ground surface since it would have required using the third and very heavy kelly bar. Today’s coring suggested to us that Mound D was built in several successive stages (2 at the least) and that sufficient time was allowed for the soils to weather before another building cycle started. I would be curious to know if there is a sub-mound platform or a small rise on the natural surface underneath this mound – this would require several cores coming up the flank of Mound D or a trench similar to the one excavated on Mound C.